Welcome to the ugliest spot in my house. This is the far right corner of the laundry room. It’s right off the kitchen, and it’s where we stow all of our pet accoutrements. 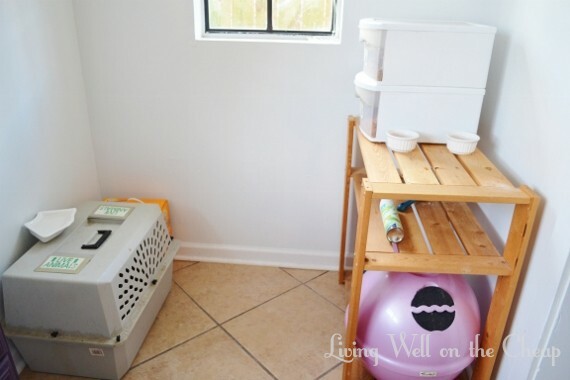 The litter box, dog and cat food, a large crate, etc. It’s my least favorite part of the house. Below you can see it from a little further back. This is right before I painted the laundry room walls white. It’s basically a nook that’s about three feet deep and five feet wide, and for the longest time I’ve dreamed of turning it into the world’s tiniest half bath (it’s just large enough to meet local building codes). The main bath downstairs is accessible only through bedrooms, so I thought adding a powder room that was more conveniently located for guests would be a good move for resale. 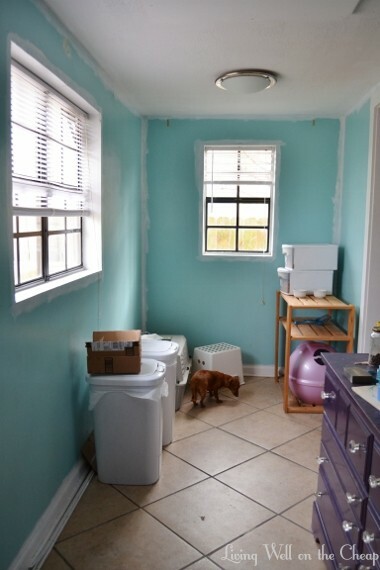 But bathrooms are expensive and I never figured out where I would move the displaced litter box. The photo above encompasses nearly everything that’s been swirling around in my mind. The wood counter, skirted front, shelves above. I don’t think I’ll be going for something as bold as those stripes, but I do feel inspired to use a patterned fabric for the skirt. And instead of a sink the counter will be solid. I think I might copy those shelves exactly because I hadn’t quite figured out how to work around the window until I saw this photo. It’ll be like a butler’s pantry of sorts, but if we get an electrician to drop an outlet over there down the line it could also be used as a desk or sewing nook. I’ve found several tutorials online for DIYing wood countertops, and since I’d only need a section about five feet long, with no cutouts or anything, I think I can handle it. Glue a couple of boards together, stain and seal, and mount the whole operation to the wall. Voila, wood countertop. So what do you think? Should I go for it? I figure even if it’s a massive flop I’m out only about $30 in lumber and some wasted time. do it!! i love the inspiration photo. it makes me want to do something similar in our laundry room. but it’s in the corner of the basement and i have a hard time wasting money/energy on a room that only sees my cat and our dirty laundry. When you were explaining it to me before I wasn’t sure because couldn’t picture it. This is great! Go for it! I think that would look great in your space. I found a pin on pinterest that showed how to DIY ‘butcher block’ countertops. It looked super easy, too. That would look great! I am IN LOVE with that striped skirt. In our downstairs half bath, we have an old school sink that is dying for something kicky like a striped skirt. I wonder if something like the above would work. Cute! Try it and see! You know that I totally am into the stripped skirt!